Thanks for visiting kids-play-soccer.com. This site came to fruition through my passion and livelihood of teaching soccer. Seriously, that is what I do for a living! I teach and create awesome opportunities for kids to play soccer. 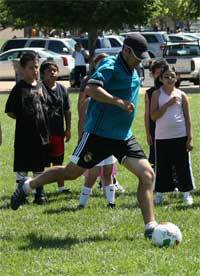 I have been teaching/coaching soccer to kids as young as 2.5 years old for over 17 years. I hold a Professional/International coaching license through the Argentine Soccer Federation/ ATFA. My soccer story begins in Bolivia, South America where I was born. I come from a soccer family with professional soccer roots. I was able to be exposed in my initiation years to two distinct environments. This instilled a bunch of questions, doubts, and the beginning of my soccer career. For me initiation was proper and profound but formation was lacking. My formation years were mainly in Northern California where my parents immigrated to from Bolivia. For them soccer formation was near the bottom of the list as they struggled to create a new life from zero. Formation was mainly in the hands of my brothers and I. These years created even more questions, doubts, and even anger. I had the natural talent in my blood but the resources for proper formation were out of my reach or not existent at the time in San Jose, CA. After graduating high school I took a trip back to Bolivia to find that they were also didn't really have it together. They had numbers and when a whole country is initiated into one sport...well the numbers are in your favor. I came back from Bolivia with a drive to change the way kids in my community were introduce to soccer. I had a bunch of ideas and passion that I wanted to share with kids. This led eventually to the opportunity of owning/managing my own soccer school called Just4kicks Soccer. This was accomplished just in time for my first son to be among the first participants of the program. I am truly blessed to be able to do what I love and not worry too much about the paycheck. Early on I new initiation is where we as a community were messing up. So...I decided early to focus on the initiation phase for about 15 years before I even contemplated coaching for a results driven club. A decision that changed my life for the better and the fruits are still being put on paper and on this site. I am a self proclaimed soccernaut that wishes to share his soccer theories with you. Thanks for reading!